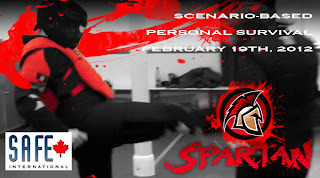 Spartan Training Gear and SAFE International are excited to present a 6-hour Personal Survival Seminar in Toronto, ON on Sunday, February 19th, 2012 from 10AM-4PM. This event is perfect for people both new to self defense or those with prior training experience. This course will give you the opportunity to learn some new personal protection techniques and then test out those newly acquired close quarter concepts in the Spartan Training Armour. We're limiting the number of participants in this class to the first 10 registrants and 7 spots are already taken so sign up NOW!! Email Christopher Roberts at chrisroberts@safeinternational.biz for details!